The extremely compact and portable SU-800 Wireless Speedlight Commander offers highly flexible control over the SB-910, SB-900, SB-800, SB-700, SB-600, SB-500, SB-5000 and SB-R200 Speedlight units. It functions as a wireless commander for compatible Nikon DSLRs without a built-in Commander mode and meets the demands of all of your remote lighting needs. 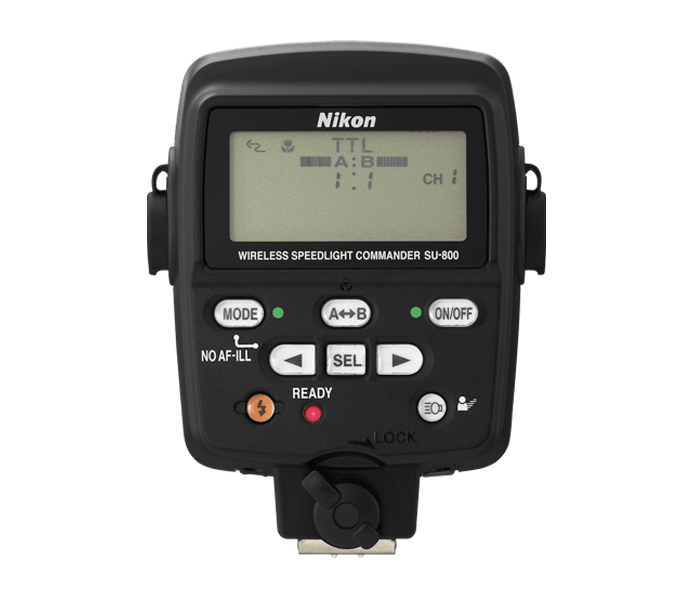 The SU-800 Wireless Speedlight Commander provides wireless control of up to 66 feet for an unlimited number of Speedlights for up to three groups. It is compatible with the SB-R200, SB-910, SB-900, SB-800, SB-700, SB-600, SB-500 and SB-5000 Speedlight units and completely supports the Nikon Creative Lighting System (CLS) and compatible CLS cameras. The lighting system you design is only limited by your creativity. To ensure precise control of your specific lighting system, the SU-800 Wireless Speedlight Commander offers 4 independent channels for competitive shooting environments to prevent any potential signal confusion. It’s built-in AF assist illuminator helps you attain critical focus in low-light situations. So whether you’re shooting bugs in your backyard or supermodels in the studio, the SU-800 provides reliable, consistent, remarkable lighting for any subject you desire.